CohnReznick’s CRE Insights & Updates shares our team’s perspectives on commercial real estate operations and development and trends in fundraising, foreign investment, and key market sectors. We’ll publish updates throughout the year. 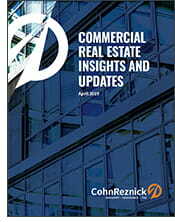 The April 2019 edition of CohnReznick’s CRE Insights & Updates shares our team’s perspectives on commercial real estate development and trends in fundraising, foreign investment, and key market sectors. We’ll publish updates throughout the year to share our industry observations at a frequency that keeps pace with today’s dynamic real estate market.